Emmanuel Macron’s victory in the French presidential election was no surprise. However, the result of the elections brings a significant breakthrough with France’s recent political history. Indeed, for the first time, is elected to the highest office of the country a relatively young man, with a very short career as a professional politician, without being supported by any traditional party. In a country like France where political careers last for endless decades and the presidents manage to reach L’Elysée after dozens of electoral campaigns, approaching the ultimate office of power patiently step by step, the victory of Macron is de facto a new phenomenon. But how did this happen? Emmanuel Macron is no outsider. As a student he followed the most prestigious path leading to the Parisian technocratic and political elite : lycée Henri-IV, Science Po Paris and finally École nationale d’administration. Like other leading French politicians, businessmen and bankers (Alain Juppé, Valéry Giscard d’Estaing, Michel Rocard, Jean-Claude Trichet) after his graduation Macron worked in a unit of elite civil servants called the Inspection générale des finances (IGF). Like many of his colleagues, Emmanuel Macron was recruited by a private investment bank, Rothschild, after collaborating with the administration of Nicolas Sarkozy in imposing neoliberal deregulations. His years in the IGF and in private banking allowed him to meet and befriend the Parisian elite of political and economic decision makers. That is one of the main reasons he was recruited as a finance counselor of François Hollande, before becoming Minister of Economy in the Valls government. Thus Emmanuel Macron is a pure product of the French elitist system, an entanglement of civil servants, politicians, bankers and businessmen based on the neoliberal consensus. Nevertheless, before becoming a Minister in 2014, Macron was completely unknown to the public. Macron’s victory is the result of an exponential increase in popularity that began when he became Minister in the Valls government in 2014 and intensified since the summer of 2016, after his resignation from the government and the announcement of his candidacy for the presidency. 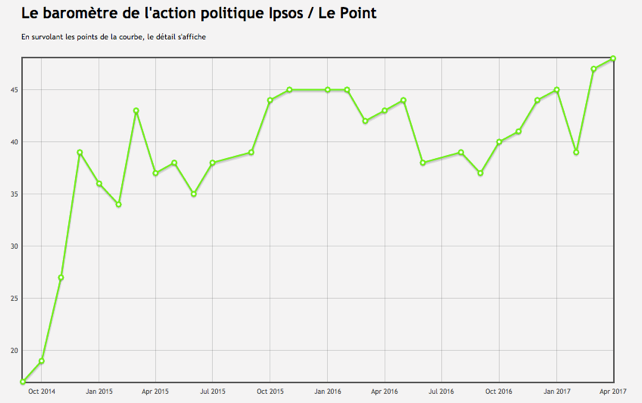 The above table shows Macron’s growth of popularity within two and a half years, from zero in September 2014 to almost 50% in April 2017. The table below shows the (almost) doubling of the percentage of respondents who consider him appropriate for the presidency from 21 to 38% within one year (May 2015 to April 2016). 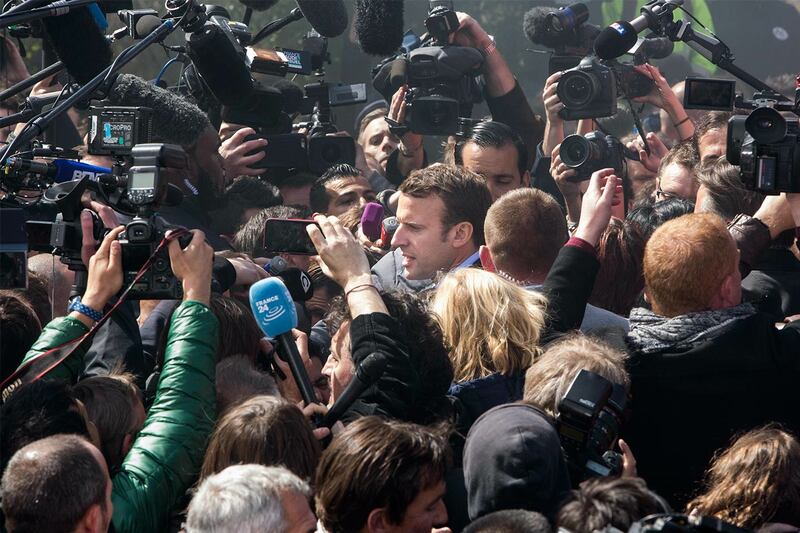 The explosion of Macron’s popularity was based on a massive coverage from dominant media whose owners maintain very good relationships with him. 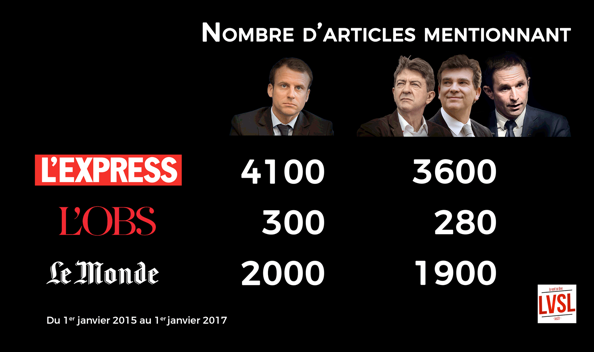 For example, as shown in the table below, L’Express and L’Obs magazines and the Le Monde newspaper, owned by two telecom moguls, respectively Patrick Drahi and Xavier Niel, Macron collected a larger number of articles than three potential left and center-left candidates put together. Now, Emmanuel Macron as a banker had an active role in facilitating the taking over of the media group Le Monde by Xavier Niel and his partners. He also was Minister of Economy when Patrick Drahi took over the telecom group SFR and he signed the special authorization forth dealon behalf of the French government. Also, Bernard Mourad, a close friend of Drahi and a banker that supervised the SFR deal, was a special counselor of Macron throughout the campaign. 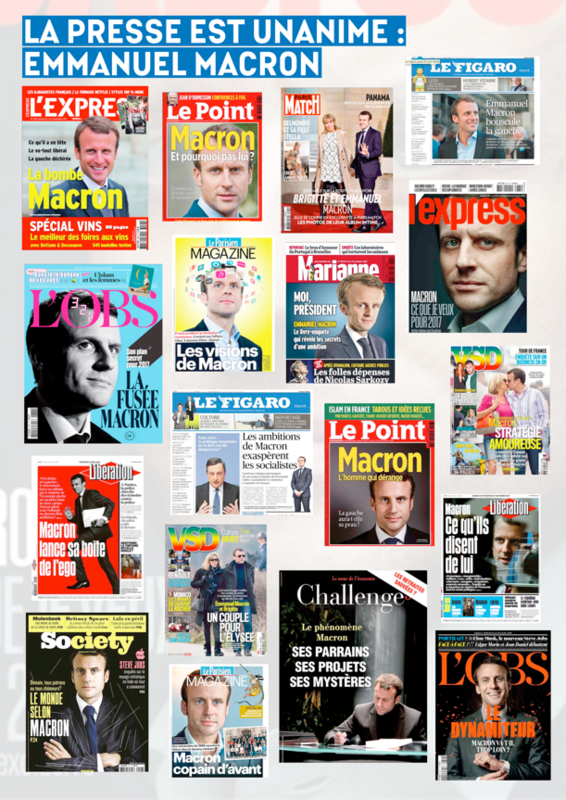 In general, the French press, either by political choice, in order to serve the interests of its owners, or by simply following the stream, has put Macron in the front page dozens of times in the last two years, as shown in the laudatory headlines below. The very same trend prevailed in the broadcast media. The table below shows the number of mentions of the 11 candidates’ names on TV and radio during the official election campaign. Macron has the lion’s share, gathering almost a third of the mentions. His name was almost always associated to “modernity” and “innovation”. 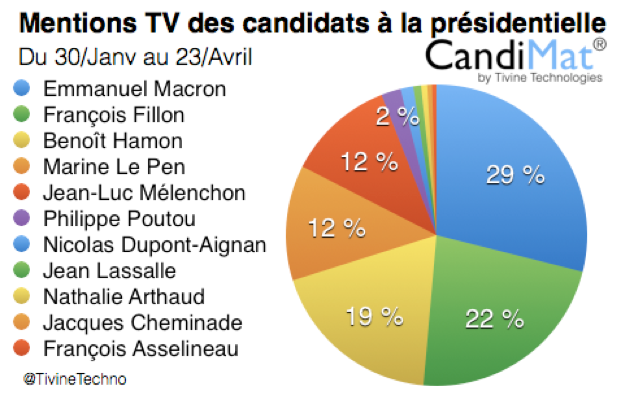 The prominence of Macron in dominant media is also visible if one examines the candidates’ presence on TV throughout the campaign. Macron comes first among all the candidates, except for Fillon who nevertheless was invited many times on TV to defend himself against accusations of misconduct and corruption. (source: Conseil Supérieur de l’Audiovisuel). From the result of the election, it seems that Macron’s public overexposure worked. Dominant media imposed on public opinion the idea that a “maverick” such as Macron ​​can be among those qualified to hold the presidency of the country. This was done in a very short period because of the general acceleration of political time in France and the political conjuncture. Macron, relying on the favor of mainstream media, managed to gain enormous attention while taking advantage of the collapse of traditional government parties and the fact that he was faced with the far right in the second round. But this does not mean that his popularity is solid and brings political support from the majority of the French. Macron’s fragile victory is reflected in the great mismatch between the tremendous positive coverage from above (media, pundits) and the relatively limited interested from below (simple citizens) as expressed on the internet, especially when compared to Mélenchon and Le Pen. 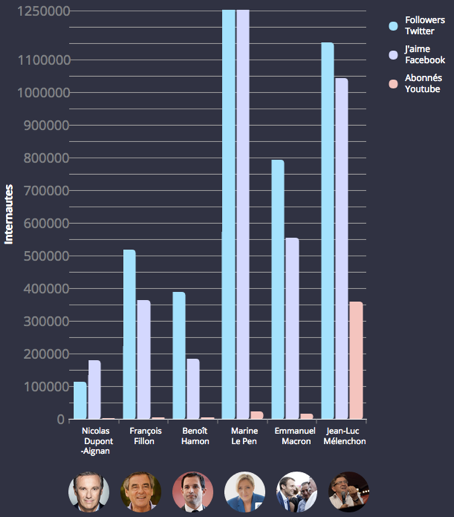 Macron is third in number of supporters on Facebook, Twitter and Youtube, well behind the Le Pen and Mélenchon. Also, Macron, in the last months of the campaign, from January to the first round of the election, generated much less searches on Google compared to Mélenchon as shown in the graph below. This means that more French people were spontaneously interested in learning more about the candidate of the Left than about Macron, despite the fact that the latter appeared much more often in mainstream media. 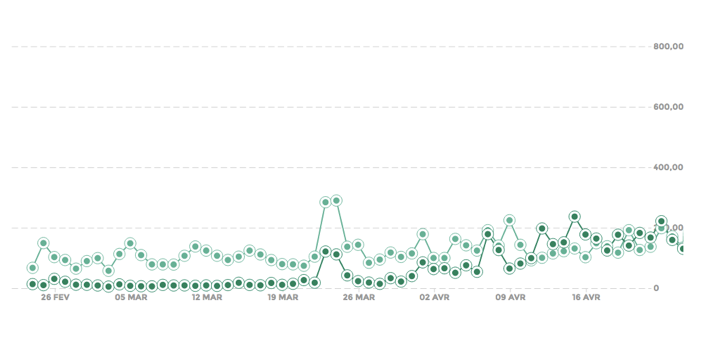 The same is true of the number of reports of Mélenchon’s name on the internet, compared to Macron, in the last days before the first round of the election. From the above, it seems that the new president of France is a political subject largely fabricated by mainstream media and centers of economic power, that is not necessarily well supported by the majority of the French. 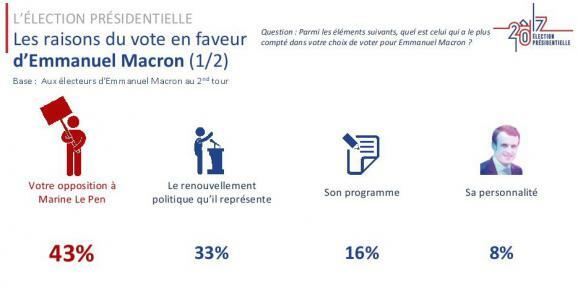 Quite the opposite: 43% of Macron’s voters in the 2nd round state that the main reason they voted for him was to prevent Marin Le Pen’s victory and 33% to renew the political personnel. Only 16% say they chose him for his program and 8% for his personality. 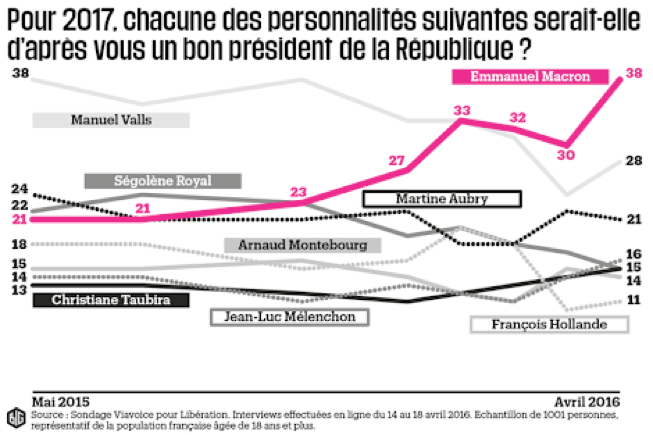 Indeed it seems that Macron is the most badly elected (mal élu) president of the Fifth Republic, with the exception of perhaps the second term of Chirac who was also elected in 2002 because he faced Le Pen in the second round. Chirac, however, received 82% of the votes with the participation at 79.71%. Macron’s election much less massive. Macron’s accession to power is thus accompanied by low confidence, high caution and a general lack of broad political support. This is confirmed by the refusal of a large part of the electorate to choose between Macron and Le Pen, which was expressed through abstention and blank vote. Large masses of citizens seem to have not succumbed to this electoral blackmail and refused to vote for a candidate with whom they disagree radically. Abstention reached its historic high of 25%. 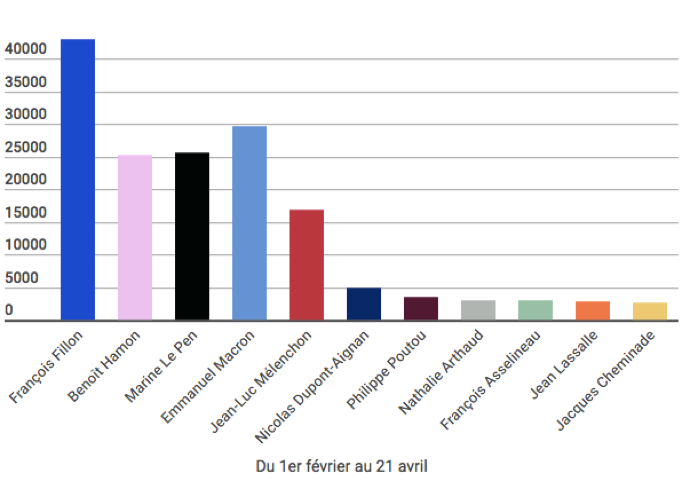 24% of Mélenchon voters did not vote in the second round, as well as 34% of young people and 35% of the unemployed, showing that they do not expect much from the new president. 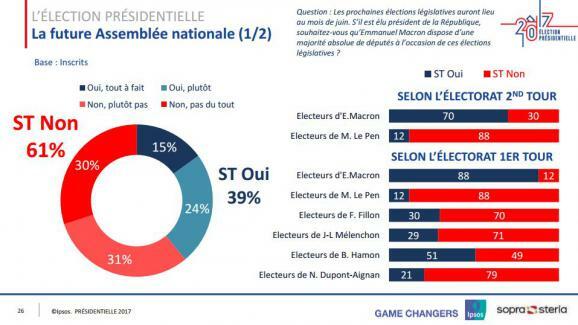 The low expectations from Macron’s presidency are also visible in the huge percentage of voters (61% of the total, 30% among his own voters) who do not want to give a parliamentary majority to the president elect. This is obviously because the electorate disagrees with some of the key choices of his program, such as the proposal for further deregulation of labor laws through presidential decrees and without the Parliament’s vote. Certainly the refusal of a significant part of the Left to support Macron in the polls, even under the threat of the Far-right, shows a radicalization that announces a hardening of the political and social climate in the coming months. However, radicalization also exists on the right and is reflected in the huge success of Marin Le Pen, who broke a record with 11.4 million votes. The stakes in the parliamentary elections will therefore be the majority that will support Macron and especially which political force will incarnate the opposition for the next five years. The battle for hegemony in the opposition has already begun between the far right and a hypothetical left-wing alliance that will try to capitalize on Mélenchon’s electoral success. But judging from the sharp internal disputes that are already happening on the left, this seems very difficult.